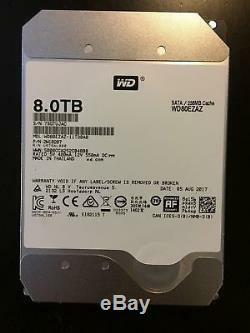 WD 8TB RED SATA NASware 3.0 3.5 SATA III Internal NAS Hard Drive 256mb WD80EMAZ. Just like the WD80EFAX, comes with white label but is still a RED NAS Hard drive. Pulled out of a brand new external. Has fewer than 5 start/stops and less than 5 minutes of use based on SMART data. Comes in clear clamshell and ESD bag. Please ask any questions you may have! The item "WD 8TB RED SATA NASware 3.0 3.5 SATA III Internal NAS Hard Drive 256mb WD80EZAZ" is in sale since Tuesday, December 12, 2017.